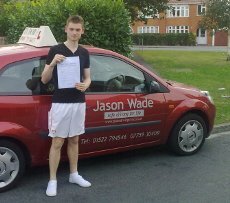 I was very nervous about learning to drive as I never had any experience with cars, however Jason was patient and relaxed throughout. Which made me feel comfortable! Not once did he ever shout or criticise me when I did something wrong, just reassured me that it's fine and told me what I should do to improve. Whenever I had a question about driving, he always gave good detailed answers. His knowledge of driving is amazing. 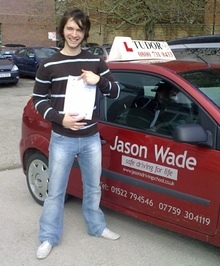 I enjoyed all my lessons (even the ones I drove bad on) as Jason was always positive and fun. I would recommend Jason to anyone wanting to drive. I honestly can't think of a bad thing to stay about him. 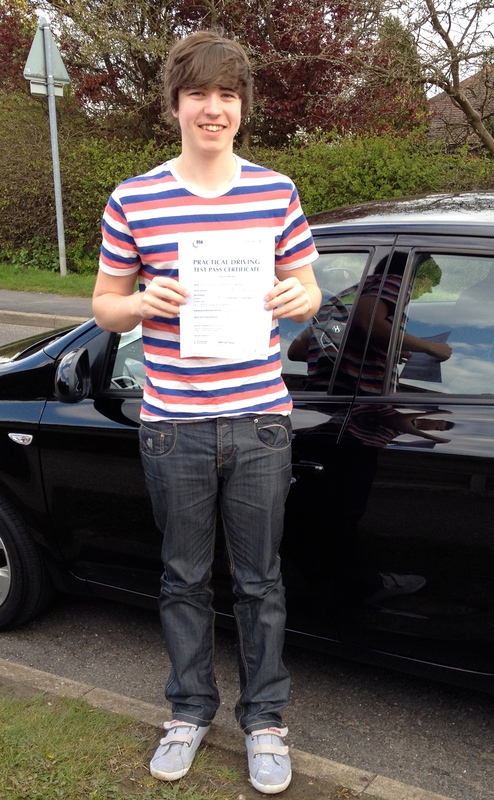 He helped me pass my test and enjoy my experience of learning to drive. If he can teach me who has a memory of a goldfish, and still stay so calm and patient, then he can teach anyone. 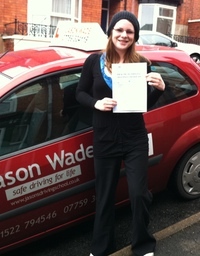 Jason is a fantastic driving instructor and I would recommend him to anyone wanting to learn to drive. He is always very patient and understanding, seeing the whole driving experience from a learners perspective. The lessons are always good fun and the time seems to just fly by. Jason is very clear when explaining maneuvers and when mistakes are made he's always ready to give guidance on how to improve. 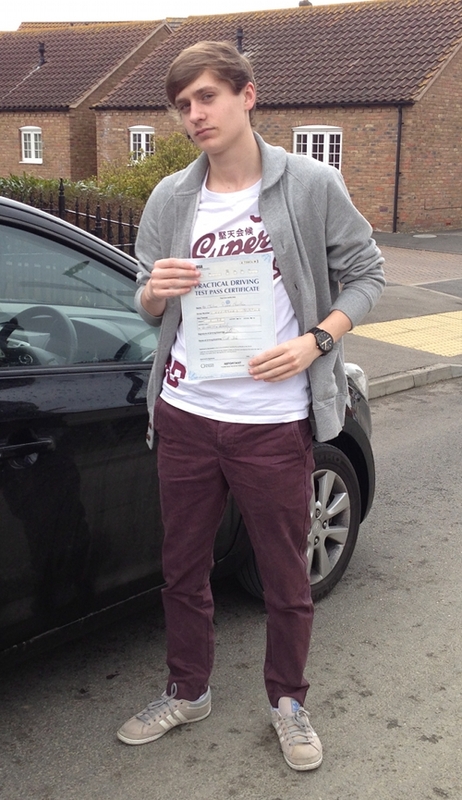 He has really given me the confidence to drive independently and I can't thank him enough for helping me pass. 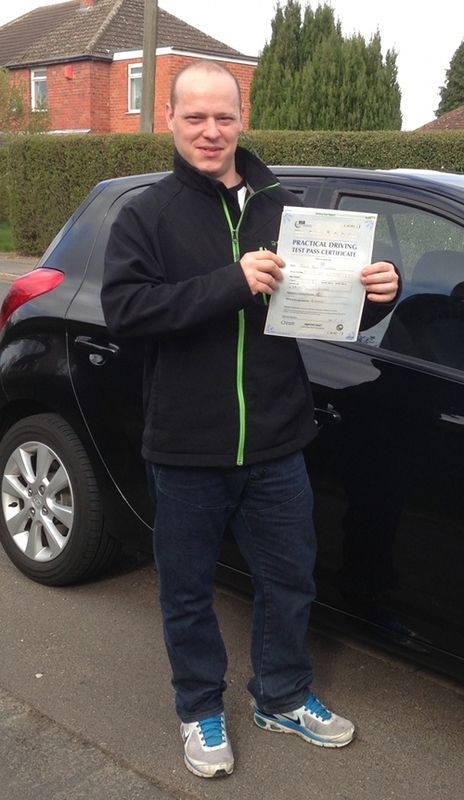 I would like to thank Jason for his superb patience�s, calm supportive instruction during my time driving with him. A true friend, whether a new driver or an older student like myself. I believe his instruction was the difference. 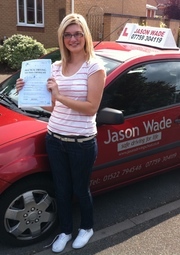 One if not the best driving school in Lincoln, again many thanks Jason for getting me passed my extended test. I was nervous at the wheel but Jason would help and not get frustrated, he always answers or re-explains things when I don't fully understand. 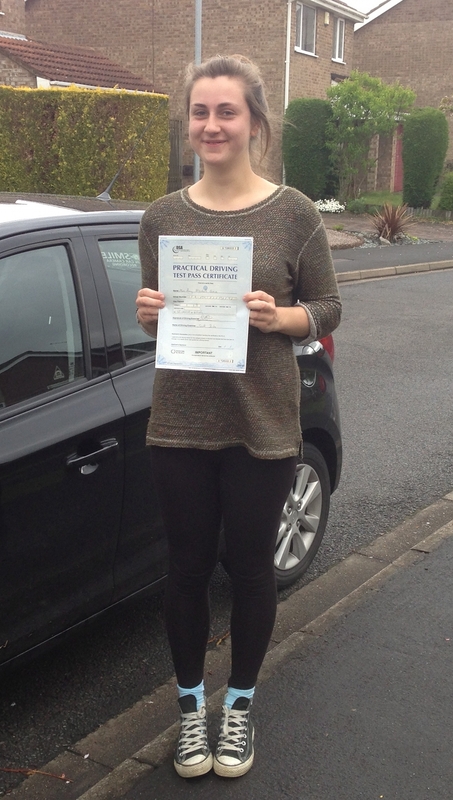 A truly great driving instructor; would recommend. 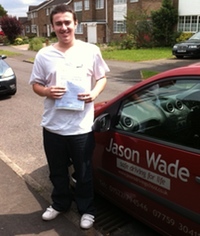 Thank you, Jason, for helping me pass my test! If you're looking for a instructor who will push you to improve and learn while being patient and understanding when you make mistakes: I'd recommend Jason. The biggest compliment I can give is not only did he feel like a driving instructor, he felt like a friend while instructing me. We had our fair-share of jokes and fun, especially in wacky situations like when we came across two ducks who were adamant to block traffic. 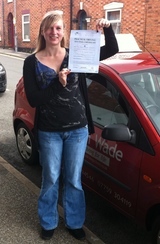 I know for a fact that without his teaching and instruction, I never would have passed first time! 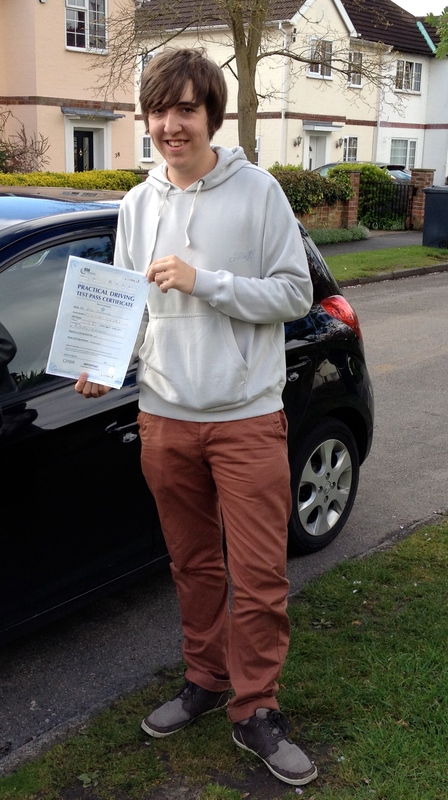 It was a pleasure learning to drive and I would recommend him to anyone wanting to learn. On my first lesson I was really nervous and lacked in confidence but Jason made me feel comfortable from the beginning and every lesson since has been full of fun and laughter. Ive enjoyed the lessons with Jason simply due to how relaxed and patient he is as an instructor, even when mistakes are made! 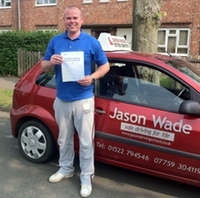 I would recommend Jason to anyone, especially those nervous about learning to drive as he puts you at ease straight away. 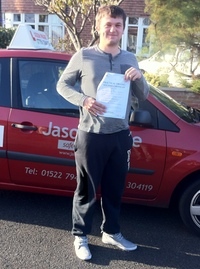 Thank you for helping me pass first time Jase. You'll be the first person that I will ask if I ever have any queries about driving in the future! 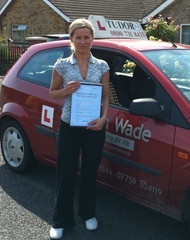 An brilliant, bubbly and down to earth driving instructor, makes you feel comfortable and would recommend him to anyone doing or starting their lessons. 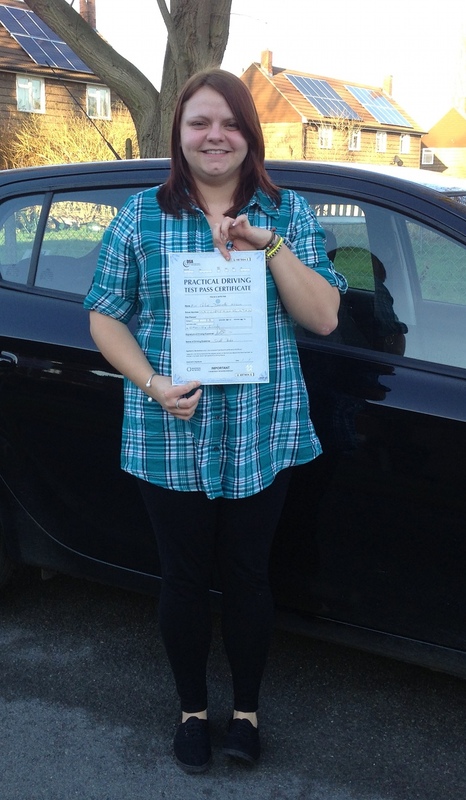 Before I started driving lessons I was slightly nervous because I had never been behind the wheel of a car before and my knowledge of driving was very limited. However I need not have worried. 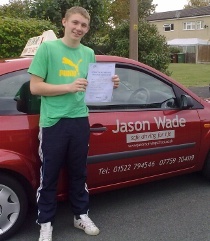 Jason was very calm throughout every lesson and made learning to drive both interesting and enjoyable. Even when mistakes were made, he added reassurance and told me to focus on the positives and how much progress I had made, rather than dwell on the bad, while at the same time talking through the errors and making sure they didn't happen next time. 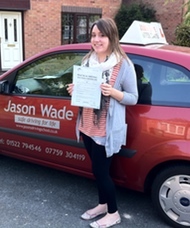 Jason is especially good for individuals who perhaps aren't the most confident, whether in terms of driving and in general, due to his relaxed manner and I would recommend him to anyone wanting to learn to drive. Really relaxed lessons, I felt very comfortable during lessons and Jason was very helpful with lesson times due to my work. My goal was to be passed by the end of January and Jason has made that happen. 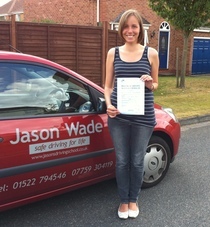 Jason is an amazing driving instructor, I would recommend him to anyone. He is a patient, calm and fun person, we had such a laugh on out lessons singing and everything! Jason never got stressed out with me when I did things wrong or forgot things - I was more of a stress head! 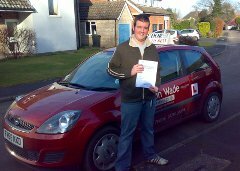 I also did my Pass Plus with Jason, he treated me like a proper qualified driver, he trusted me which gave me the confidence I needed. Thanks for absolutely everything Jason, you are the best! 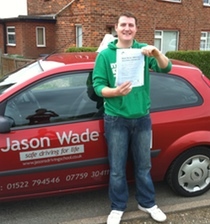 Jason is a great driving instructor I would recommend him to anyone. He is a patient instructor and gives you simple but great advice and techniques when your learning. He is very friendly and easy to get on with had so much fun learning how to drive. I couldn't have asked for a better driving instructor. 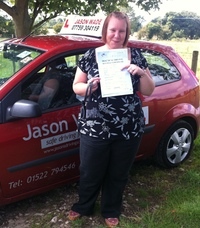 I was nervous and wasn't sure how good I would be but Jason helped to build my confidence so I could take my test. I enjoyed the lessons and no matter how many times I asked the same question Jason would go over it again and again in an easy manner so I could understand. One thing he said to me, that I will never forget when out driving is 'think everyone is out there to get you' and it does work!! I really enjoyed having lessons with you, I was nervous to start on the first lesson, but you made me feel really comfortable & was very supportive & fun in every lesson, time just flew by on my lessons. I didnt think I would be passed this quick especially in 4months! 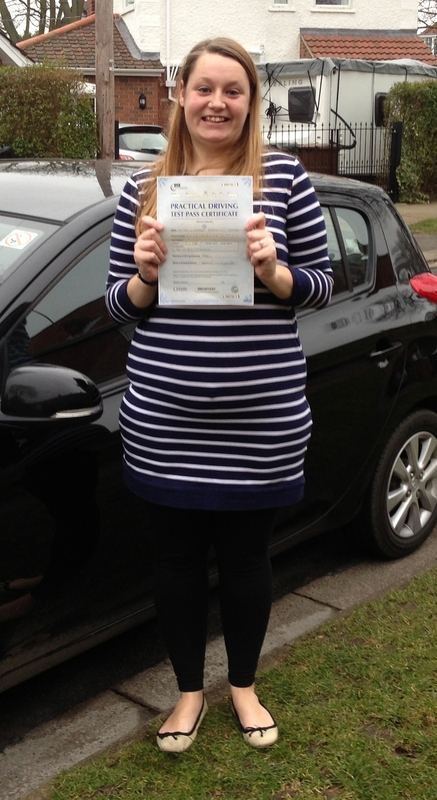 I will recommend you to everyone & thank you so much for teaching me to drive & making me pass my theory & practical first time. 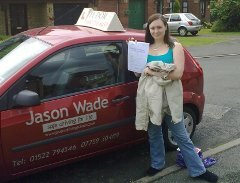 I have been taking driving lessons with Jason since the end of January (2012) and I was very nervous at first but Jason was always friendly and supportive. I felt comfortable to ask any questions, even though they sounded silly in my head. I really enjoyed my driving lessons and felt like I learned a lot. 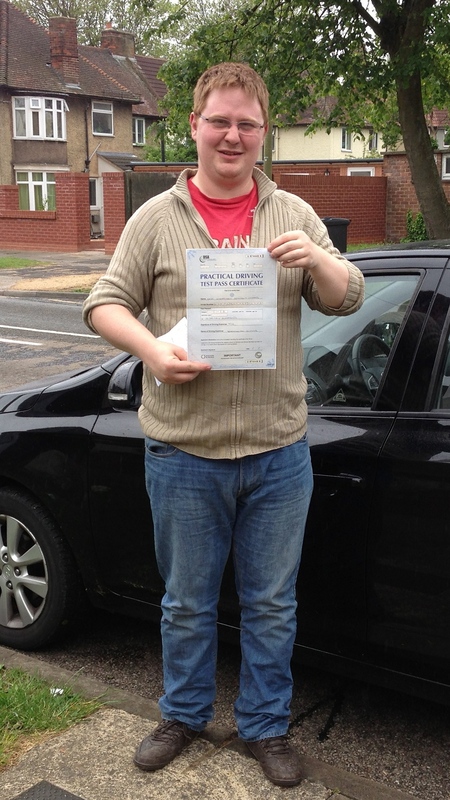 I was fortunate enough to pass my driving test first time in early September (2012). Jason also told me to be in touch if I had any questions about driving which was reassuring, as I am no longer his student. 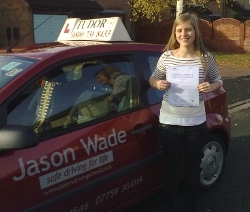 I was very nervous about learning to drive, but Jason made it really easy to learn safely and increase my confidence behind the wheel. I looked forwards to my lessons and didn't worry about struggling with new things, as Jason would talk me through it until I picked it up. He was very patient with me even when I made silly errors, and always encouraged me in a calm and relaxed manner. Jason is a great instructor and I would highly recommend him to every learner. 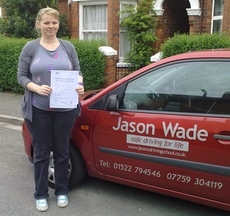 I was nervous about starting to learn to drive, but with Jason's help, my confidence soon increased. He's friendly, patient, calm and reliable, and would never get angry or shout at me. The lessons were always relaxed, and he let me practise things that I thought I needed to. His instruction was very thorough and thanks to him I passed in May 2012. I'd definitely recommend him to anyone wanting to learn to drive. Thanks for all your help Jason! I have never thought I would drive. My husband has been persuading me for over 10 years to learn to drive. He has chosen an instructor for me and it was a very good choice. Jason was very patient and understanding even when I was doing the same mistakes again and again. 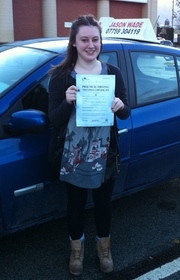 I liked my lessons and I've just passed my test. Jason's driving school is a great place to learn at. 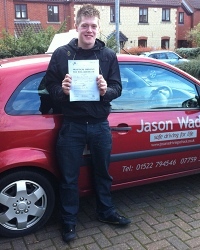 As Jason is a friendly,calm and patient person who was able to make me feel calm and relaxed when ever i got into the car. I enjoyed the lessons far more than I thought I would and he helped build my confidence up to take my test. 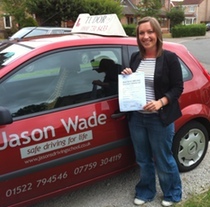 I really enjoyed taking my lessons as Jason is a great instructor who is dedicated to teaching people to drive and he enjoys it as much as I enjoyed learning. Thanks for getting me through my test Jason. 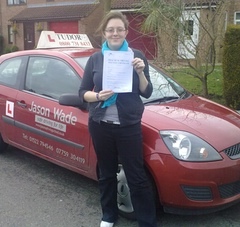 I really enjoyed my time learning to drive with Jason. 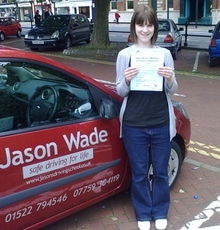 When i first began driving, I was very nervous and didn't really know what to expect, though learning to drive with Jason helped me to get over my nerves. Jason is really patient and supportive, makes everything easy to understand and is happy to go over things as much as you like until you feel confident. He is really friendly and easy to talk to, making each lesson enjoyable. When it came to taking my test, I was so nervous and it took me a while to pass but Jason always remained posative when I was wavering a bit. 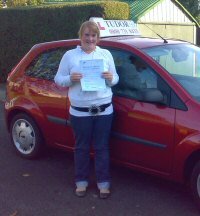 Knowing that he beleived I could drive well enough helped to keep me focused and boosted my confidence loads. 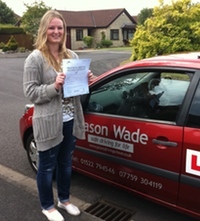 I really would recommend Jason to anyone who wanted to learn to drive, I will miss my lessons! When I first starting driving again after over a year of not having any lessons, I was very nervous and had forgotten a lot of what I had learnt. 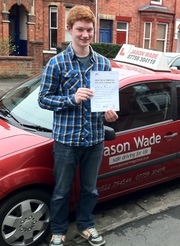 Jason was very patient and made me feel confident that I could pass my test. He was very relaxed and enthusiatic and easy to get along with. I really enjoyed my lessons and even when I thought I couldn't do something or made some silly mistakes, Jason made me feel that I could and helped me to just slow down, think what I was doing and learn in a way I could remember. 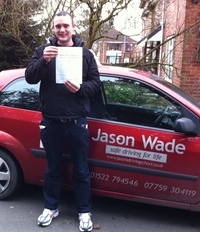 I would definitely recommend Jason as an instructor to anyone wanting drive. 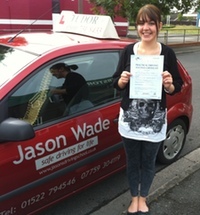 I will miss our lessons but I have now passed thanks to Jason. 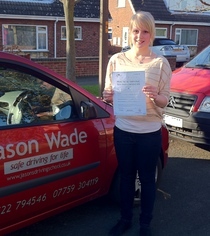 "Jason Wade gives excellent driving lessons where I was consistently learning something new every time. 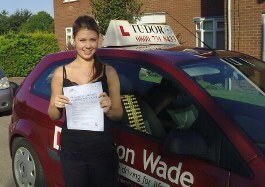 Driving lessons were always relaxed and enjoyable, with patience and hard work he helped me pass my driving test. Thank you again for your help, the lesson to learn overall was definitely to never give up. 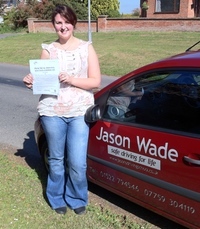 I highly recommend Jason's driving lessons to anyone looking to learn driving effectively in a relaxed and friendly atmosphere." You couldn't ask for a better instructor, no matter how many times you make a mistake he won't yell or shout at you, he'll talk to you in a calm manner as he always does. When I was going in for my test he filled me with confidence and with that I passed with flying colours so if he says to you that you are ready for your test he knows you can pass. Thanks again Jason for teaching me hope you had a good christmas and new year. Jason is a fantastic driving instructer he is a very patient, friendly and very calm man, and he's got a good sense of humor so you can have a laugh and joke with him. He won't get mad if you make a mistake he will tell you where you have gone wrong, and help you get it right. You can ask him to go over any of the manouvers if your not sure about them. 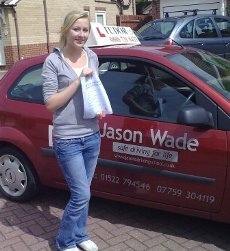 When I started learning to drive I was nervous and after a couple of lesson Jason made me feel confident as a learner driver. Jason will tell you when you're ready for your test. 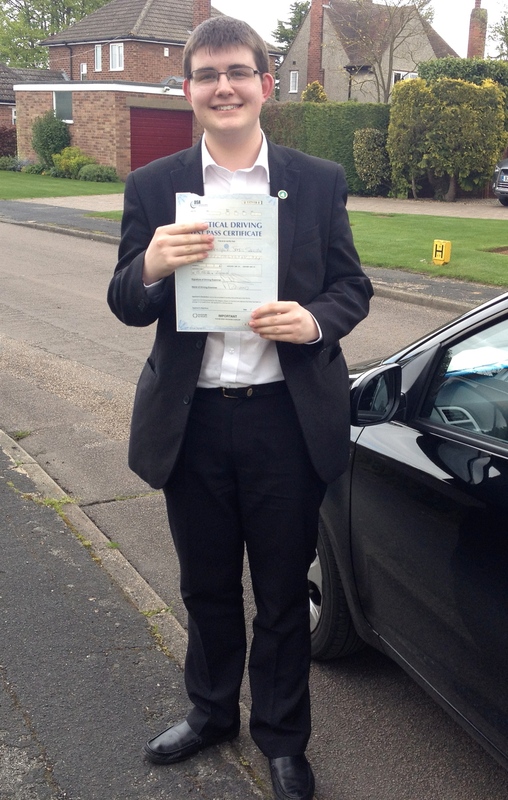 I did my pass plus with jason and it was fantastic, and I got a really good understanding of the motorways and how to deal with them in sun, rain and cold weather in one day, its a really good thing to do so that when you do go on the motorway its not a scary thing to do. Jason is the best instructor. Thank you for teaching me to drive and helping me pass my test. 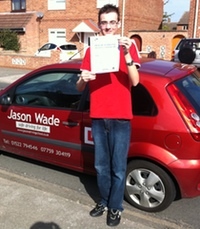 Jason is a excellent driving instructor! 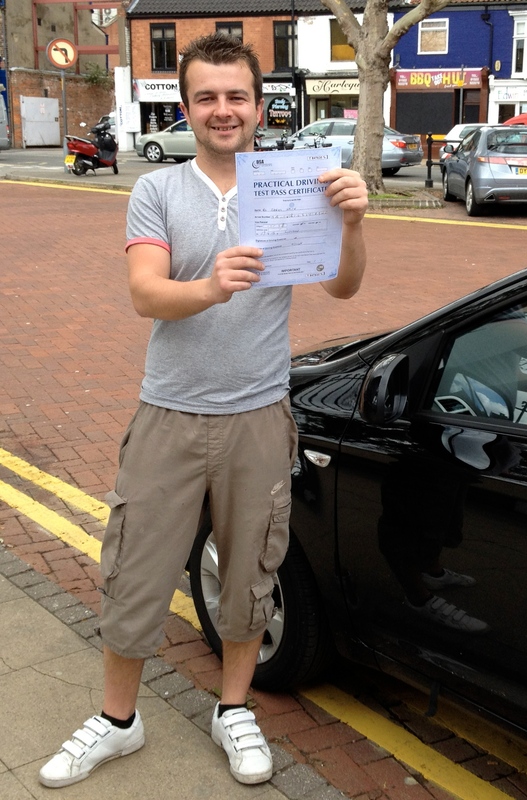 I would recommended him to anybody wanting to start driving , he is like a mate & everything is relaxed. Jason teaches you everything you need to know to pass you driving test. Jason made driving a pleasure. He is patient and enthusiastic, and helped to raise my confidence too. I had never driven before, and I was reccommended to Jason by my brother in law. I was very scared when I started to drive for the first time but with Jason in the car you are 100% safe. 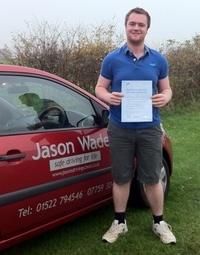 Jason is a very experienced and professional driving instructor, and he has an excellent teaching technique, he gave clear and easy instructions which helped learn and understand quickly. 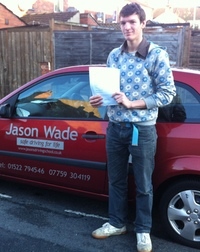 He is very very very :) patient and supportive so when you drive with Jason you feel comfortable and relaxed. 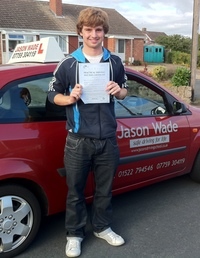 And the best thing about Jason I could not find a better instructor in Lincolnshire. 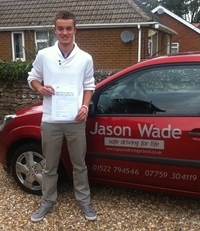 Jason is a great driving instructor! 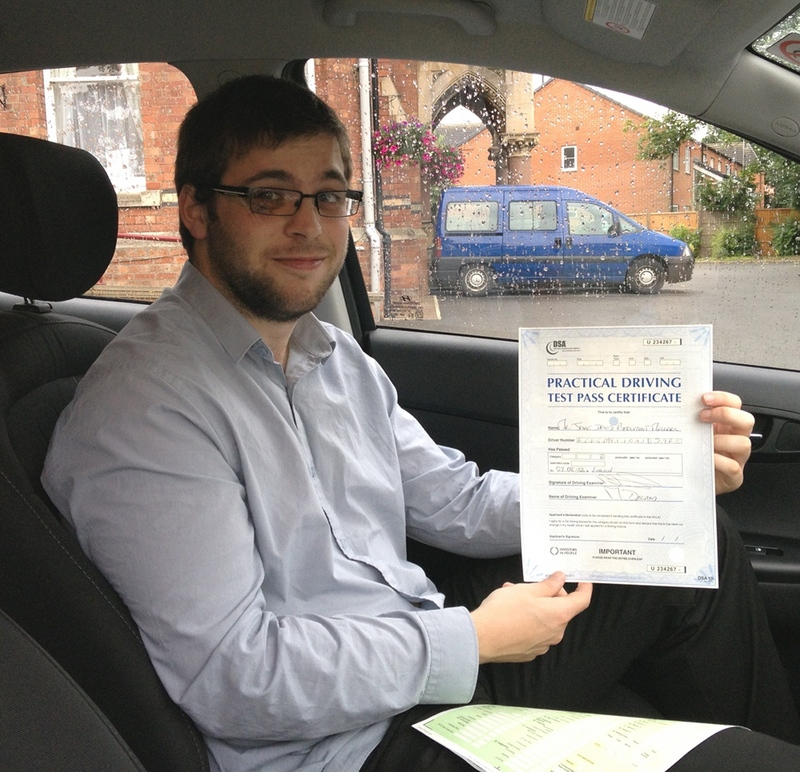 He is not only excellent at teaching you absolutely everything you need to pass your test, but great at making you feel combatable and relaxed. His lessons were fun! 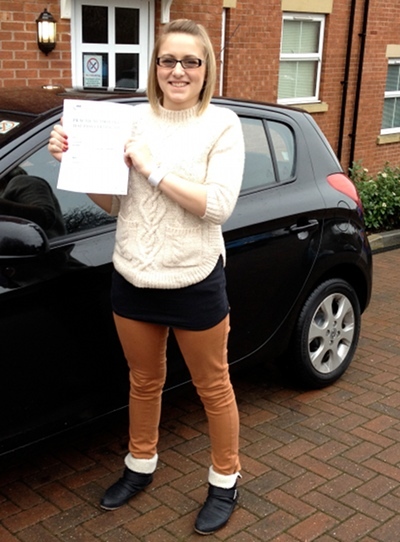 But with well thought out structure, and instructions so professionally clear and precise and this, for me, enabled me to pass first time. 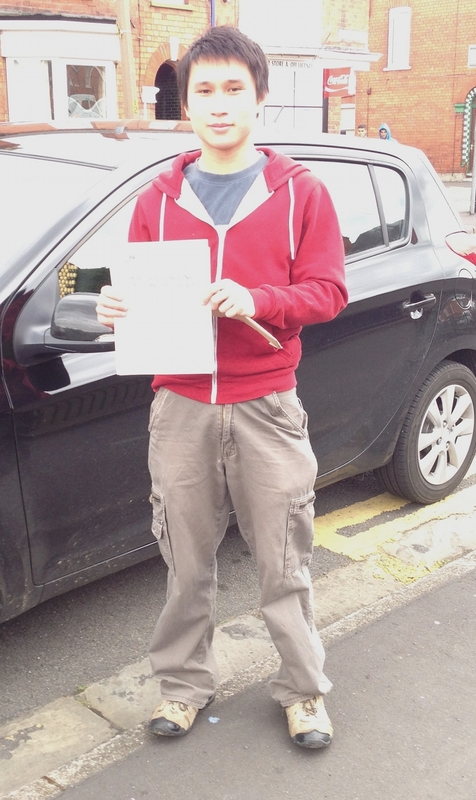 He was also very patient, which shows as every time I made a mistake whiles driving, he wouldn�t get mad but go over how I made the mistake and present constructive, easy to understand advice helping me to advance, and pass my test. He will always have your best interest in mind, and his main goal being to get you passed! I would totally recommend Jason to anyone. Thank you for all your hard work and patience! 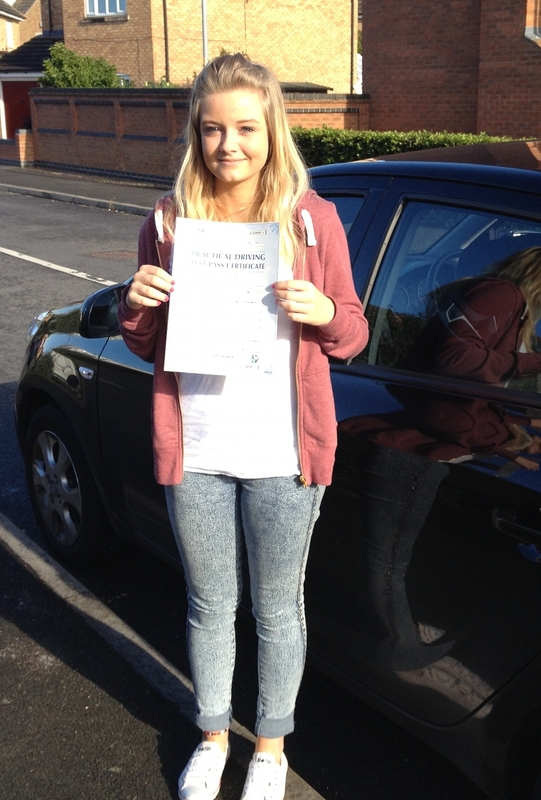 Thank you for all your help and advice throughout my time learning to drive with you. I would highly recommend Jason to learn to drive with. He makes it easier to learn with his relaxed attitude while ensuring that you learn everything you need to know to pass. I would highly recommend Jason to anyone. He helped me get to grip with my nerves and helped me to believe in myself which then allowed me to pass my test at last!. I knew if I had failed my test then it would have been through my own fault and not of Jason's teaching as he had taught me everything I needed to know and if I was ever unsure of anything he was happy to explain it all to me again. He is very patient and understanding and so easy to get along with he never made me feel under pressure or anything. 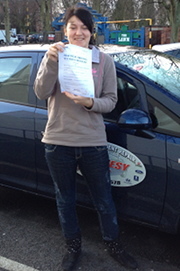 Jason is an excellent instructor, he made me feel relaxed whilst driving and made the lessons very enjoyable. I would definitely recommend him to any one wanting to learn to drive. I loved every minute of learning to drive with Jason! He's patient, fun and easy going. From the first lesson I felt at ease, and he was always encouraging even when I made mistakes. I would recommend him to anyone wanting to learn to drive. 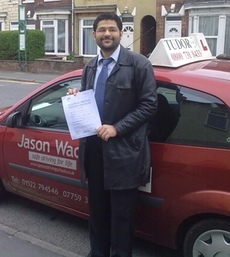 Jason is a very patient and friendly driving instructor. 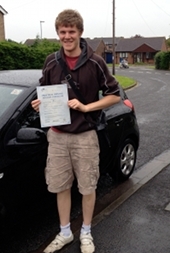 He has helped me pick it up fast and is a very good driving instructor. I have recommended Jason to all of my friends. Jason is very patient and easy going. He created a very comfortable, fun atmosphere and is easy to talk to. 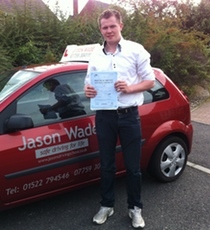 Jason is a brilliant instuctor, he made me feel welcome and comfortable right from my first lesson until my test. He made learning fun and enjoyable and always had my best interest in mind. There is not much i can say that hasn't already been said, but I will certainly miss driving with jason. Rhys asked me to say it was a very early test and he didn't have time to do his hair. Hey Jason want to say thanks once again it was a pleasure learning and passing my test with you wish you all the best in the future. Jason was really patient and fun, his teaching style is really relaxed but also structured with clear routines so it's easy to remember the important stuff. Jason was really friendly from the very first lesson and really encouraging throughout so you're confidence never takes a hit if you make a mistake. 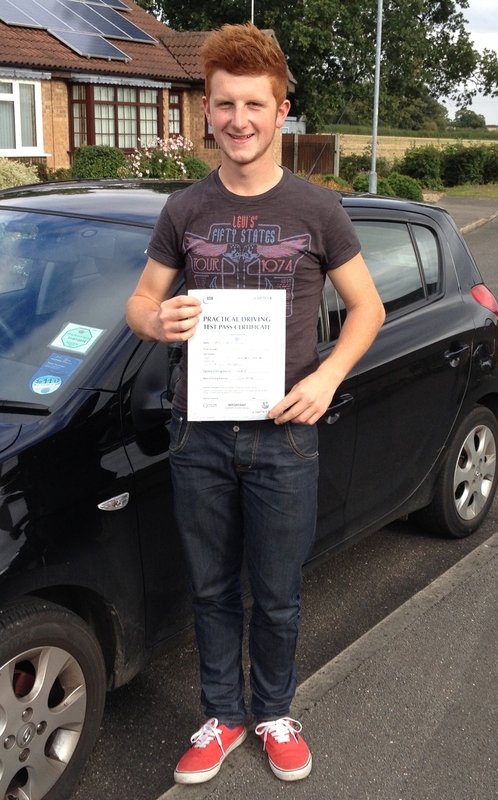 I would recommend him to anyone, both new drivers and those like me who had been at it on and off for ages. As soon as I met Jason I could completely relax. Jason is one of those genuinely nice people, so I trusted him as soon as he got me driving. His teaching methods really suited me (even if it did take me forever to remember all the routines!). I was always making mistakes but he never made me feel stupid, he helped me think about the mistakes and how to correct it or its effect on other drivers. I didn't feel pressured or rushed. 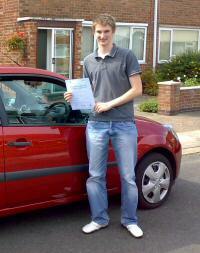 His confidence in my driving is what helped me pass my test; I would have been a nervous wreck without him! Since I've been driving it hasn't been the same without him! The radio just isn't the same as our random conversations; he is such a great instructor I'd recommend him to anyone, especially the nervous type who thinks they'll kill someone as soon as they step in a car. 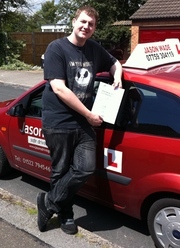 Just to let all learner drivers out there Jason is very patient,easy going and is easy to talk to. He is one of those people you just click with straight away, If for some reason I ever had to do my test again [fingers crossed I don't] I would be more than happy to meet back up and drive with him again. Jason was recommended to me through a friend who had driven with him. Jason is really kind, caring and patient and made driving seem so simple. He was never in a rush and would explain everything again if forgotten. 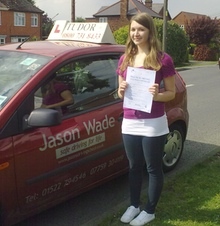 I really enjoyed my driving lessons with Jason and now miss the random chats which occurred on lessons. He gave me confidence, and made me believe in myself which is essential to be a good and safe driver. I had never driven before but always wanted to learn. Jason was recomended by a friend Wei (also on this page) and when we first met he was really kind and understanding. 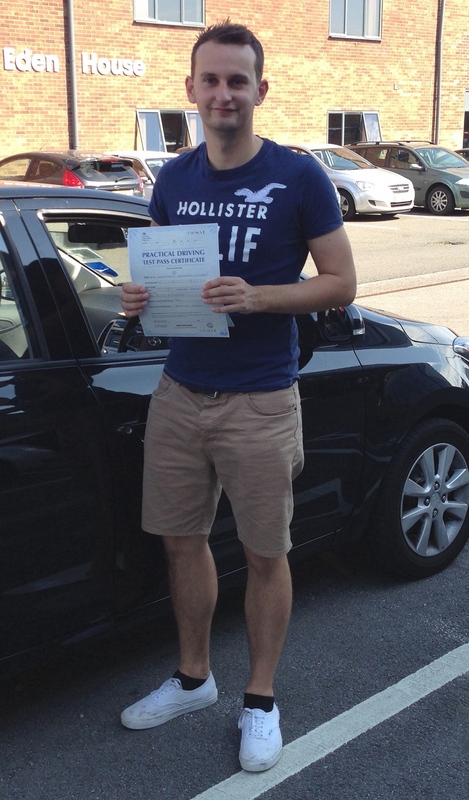 From the first lesson Jason was so helpful and calm, I felt so at ease driving and we soon got talking like we had known each other for years! Jason is so flexible and there was even a day that we both missed our dinner so i could have a lesson! 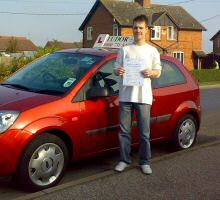 He is a great instructor and I would recomend him to anyone wanting to learn to drive. 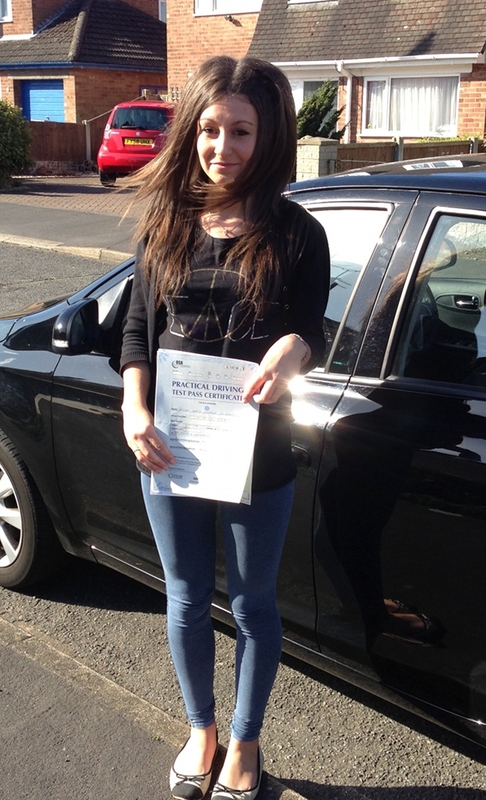 I passed first time and its because of Jason, he made me believe in myself and built up my confidence on the road. Thank you Jason cant wait to encounter you when doing my pass plus! 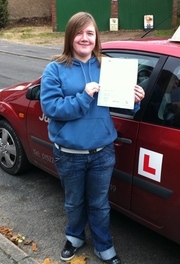 Having failed my test twice with my previous instructor, I was about to give up on driving. 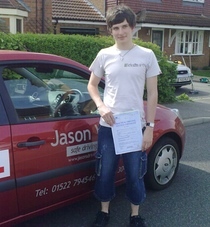 Looking through google I found jasons driving school and clicked on it, I have to say it is one of the most helpful and best laid out websites that I have used. I got in contact with Jason and arranged a lesson for the following week. As soon as I got in the car with Jason I really felt at ease with him, and we were soon chatting as though we had known each other for years. 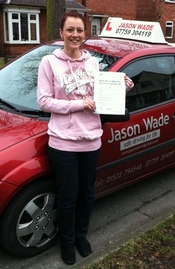 I thoroughly enjoyed learning to drive with Jason, and cannot recommend him enough to anybody. 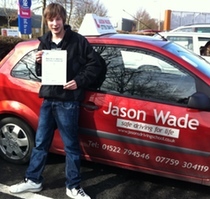 So if your like me who was going to give up driving, then don't, give Jason a call and arrange a lesson. Thank you very much Jason, regards Nathan. 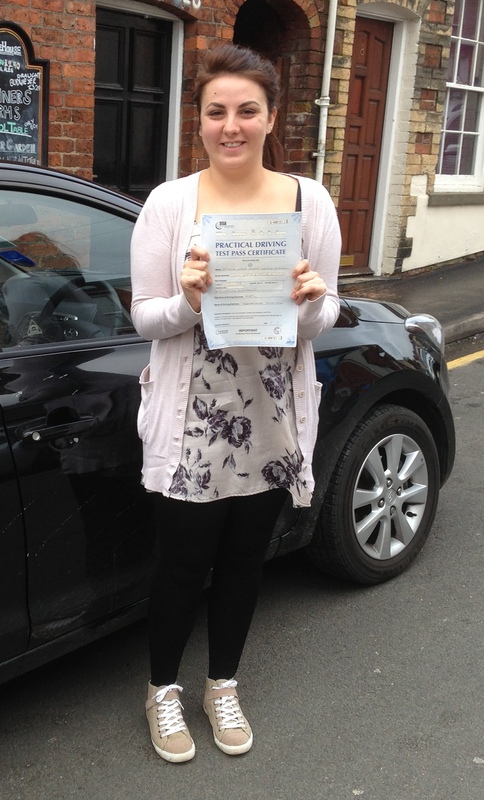 I am twenty seven years old and passed my exam first time. 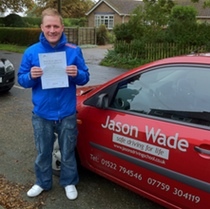 I have had a few driving instructors prior to finding Jason and from that experience I can highly recommend him. 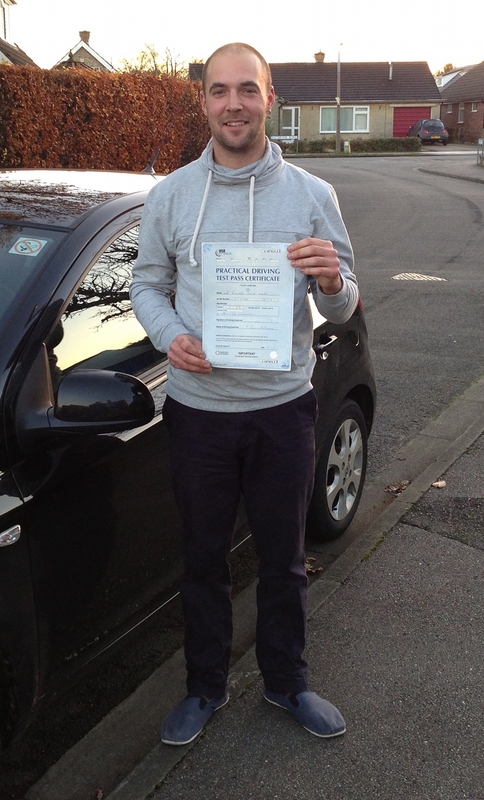 He is very competent, patient and friendly; someone you can trust in learning to drive and pass the practical test. Learning to drive with Jason was great. 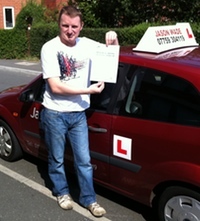 He is calm, reassuring and patient which all make him an ideal instructor. He is polite and thorough with his teaching. 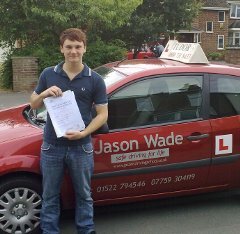 Jason and his methods gave me confidence when on the roads, and I passed. He is reliable and friendly, and always good for a laugh which is great because you don’t feel under pressure. I can’t thank Jason enough for what he did right before my test. 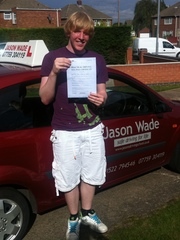 Due to me mixing up the correct date of the test, I nearly didn’t make it in time, but Jason was able to come to my aid. Thank you so much Jason! All in all, I highly recommend him to anyone. Working with Jason was Fab! Calm, cool and collected is the best way I would describe Mr Quiksilver! He gave me confidence, and made me believe in myself. I called Jason one Friday morning and was driving the same day in the afternoon! The best thing is there is more practical than sitting and talking which was great for me as its easier to remember. 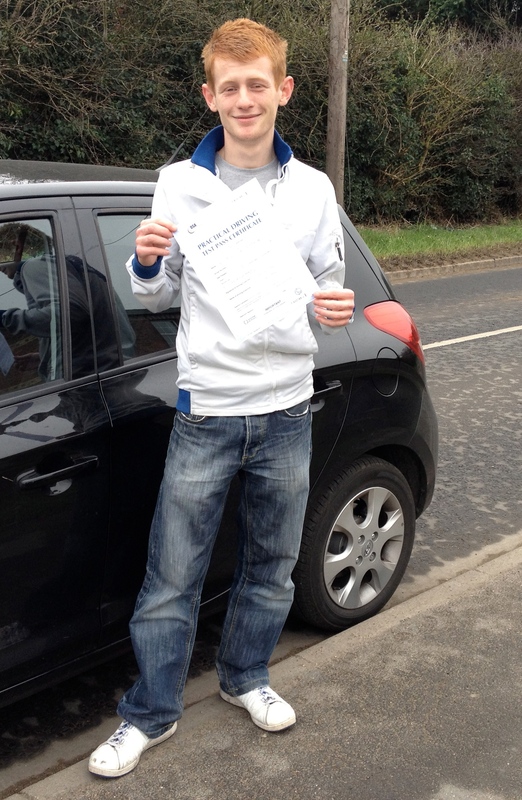 I passed 1st time and that is down to Jason giving me the confidence to do it! 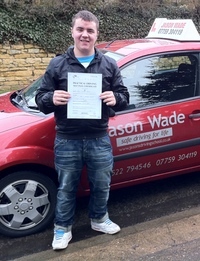 I would recommend Jason to anyone and look forward to doing my pass plus! Jason is patient, calm and understanding. Thanks to him, nothing suprised me during the exam. I recommend him as an instructor. Especially for foreigners. 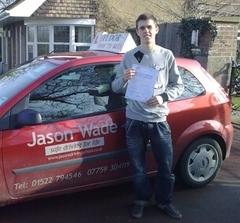 The three words I would use to describe Jason as a Driving Instructor are Patient, Understanding and Positive. Whenever I was feeling like I wanted to give up Jason reassured me that I would get there in the end. Jason is clear in his teaching methods and has great motivational skills so I would highly recommend him. Thankyou Jason for helping me to reach my goal. Passed in a hire car! 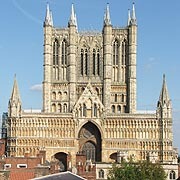 I was learning to drive in my home county of Norfolk, but had to move to Lincoln for University. Jason was recommended to me by friend Simon (who is also on this page! 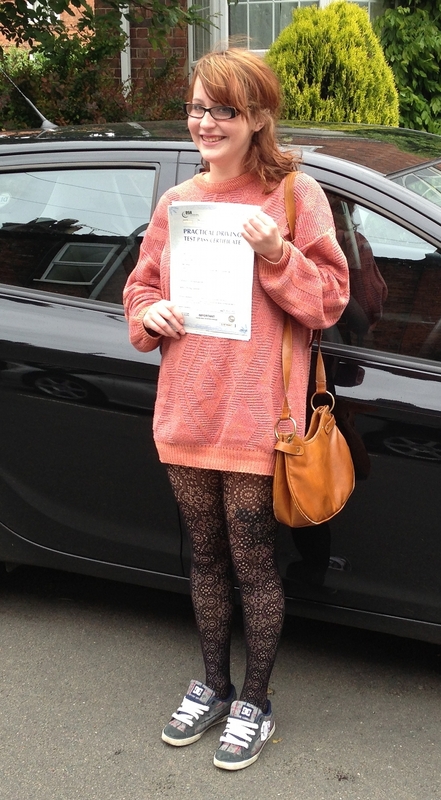 ), and I started taking driving lessons again. 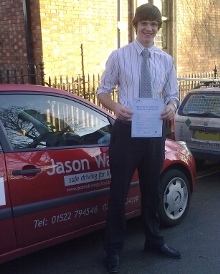 I would highly recommend Jason to anyone who wants to learn to drive around Lincoln as he is very friendly and has the patience of a saint! 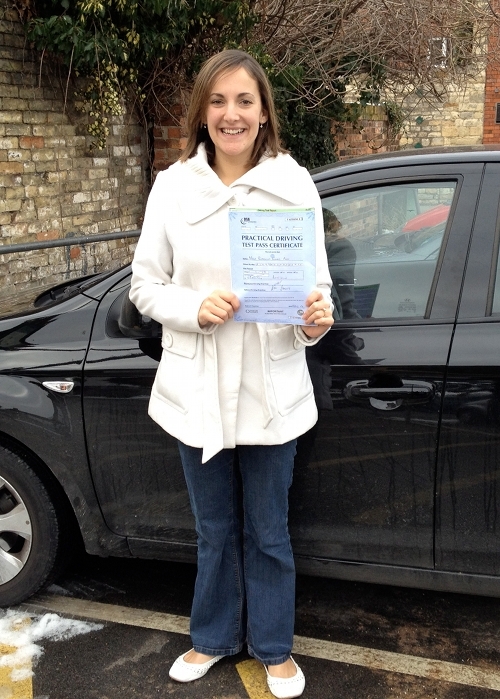 He helped me to gain confidence with my own driving ability and is really welcoming. 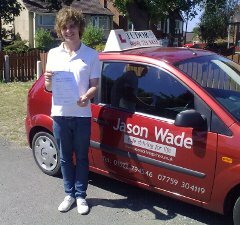 I honestly can say that I never thought I would pass my test, so if anyone is feeling the same way as I did, go with Jason. In fact, don't hesitate to go with Jason anyway, you won't regret it. 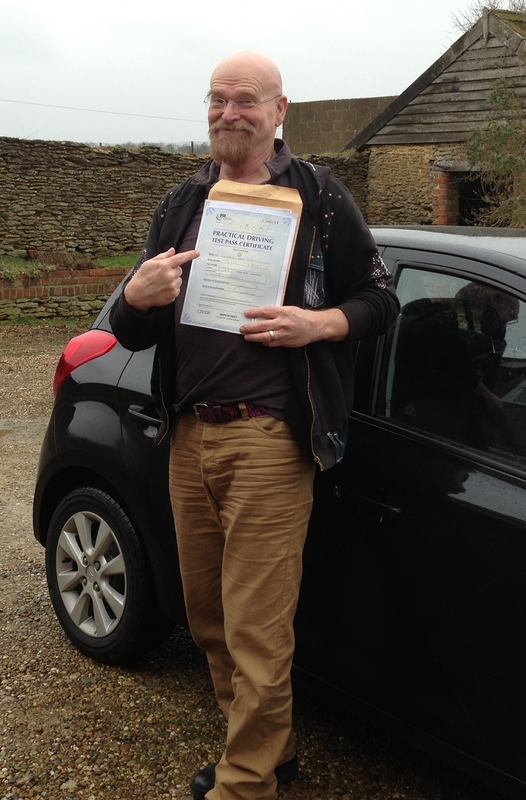 After Nearly 20 years I have finally passed my driving test and this is thanks to Jason Wade the very calm, patient and not at all pushy driving instructor! I have travelled a lot over the years and never really settled long enough to get my test passed but on settling in Lincoln I came across Jasons advert in the paper and thought id give it a go! 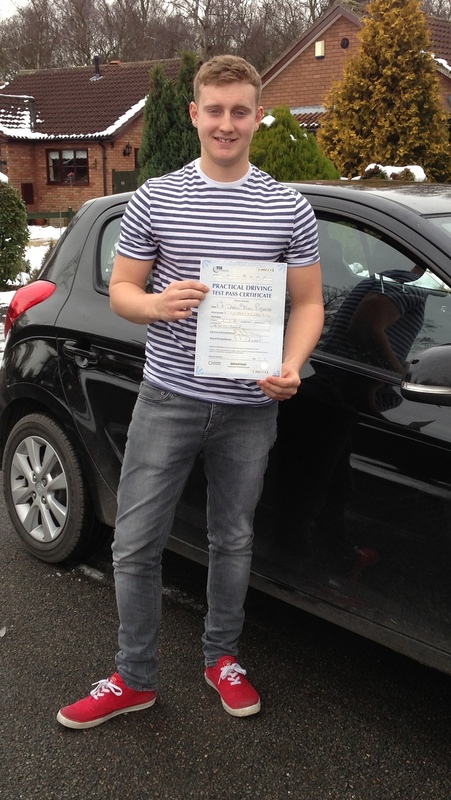 He put me at ease straight away, didnt ever get cross and explained things very clearly and precisely so even I could understand what to do when doing manoeuvres and helped me gain confidence and belief in my driving abilities. 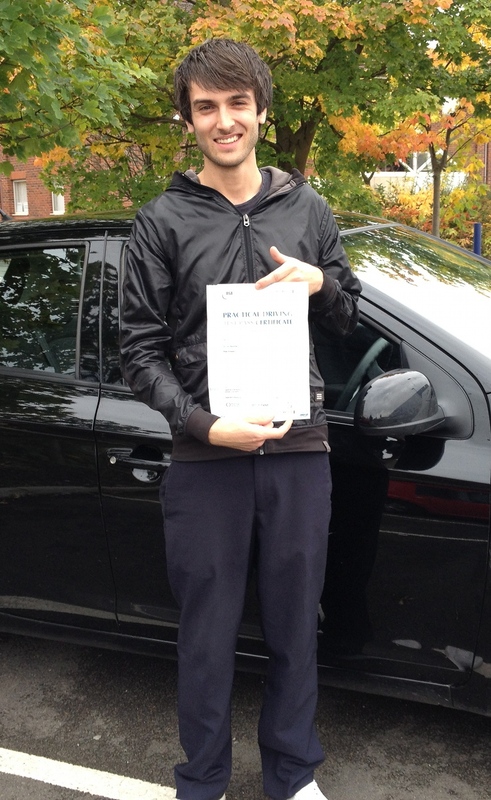 I highly recommend him and hope he enjoys every minute of being a full time instructor!! Thanks dude see you on the road. Thanks to Jason, I got my License in the first attempt. He just made everything so easy with his communication, patience and teaching skills. He is very easy to get along with, and gives you that little push to achieve what it takes. Jason is also very flexible with lessons and timings. I just can't recommend him enough, Best of Luck! 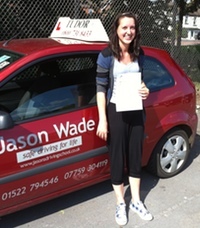 I can not recommend Jason enough as a driving instructor . He was fantastic with me through tough times and never lost his belief in me. 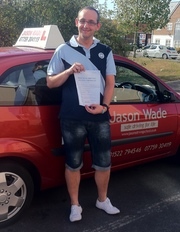 He is calm, relaxed and does not panic; qualities driving instructors require and Jason has them in abundance. Id like to thank Jason for all your hard work with me, it paid off in the end eh! Like i said before, I cant recommend him enough. Indeed I have already introduced 2 people and they both think the same. Thanks Jason. Enjoy having this as your fulltime job. I know you will. 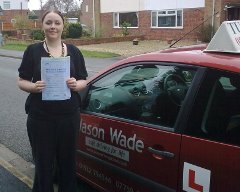 I was introduced to Jason by my sister when I returned home from University and wanted to take up driving lessons again. The first thing I noticed was how calm friendly and knowledgeable he is. If I was feeling particularly nervous about driving he would soon reassure me. 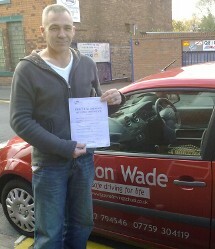 He very talented driving instructor and I wouldn’t hesitate to recommend him to anyone thinking of learning to drive. 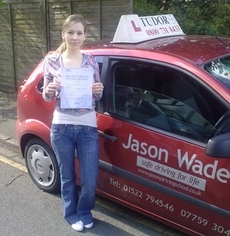 It took me a few years to find the time and money to learn to drive and Jason never rushed me. He was always flexible with when and where lessons took place. Jason is truly a pleasure to learn with. 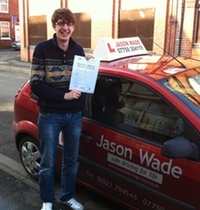 Jason is a brilliant driving instructor. He was very supportive, understanding and patient. He gave me clear and easy instructions which helped me to learn and understand quickly. 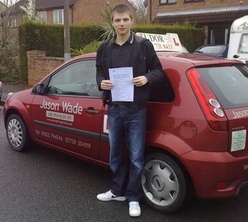 He is always calm and patient and an all round good driving instructor. I would recommend Jason to anyone wanting to learn to drive. Thanks Jason for helping me pass and learn to drive. 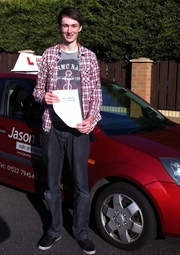 I approached Jason as I needed to brush up on my driving skills in order for me to pass my driving test in the UK. I already had a foreign driving license then but this was not recognised in this country. 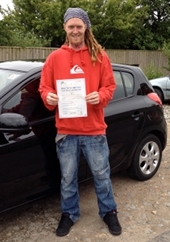 Jason is a very patient instructor and gave me very clear instructions, making sure that I had learnt all the correct techniques to enable me to pass my driving test. I would highly recommend him as your driving instructor! I am even planning to book a Pass Plus course to further boost my confidence in driving along the UK motorways. 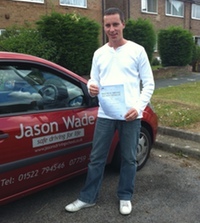 Jason is a great driving instructor who has a wide knowledge of driving and has a very easy way of teaching you! 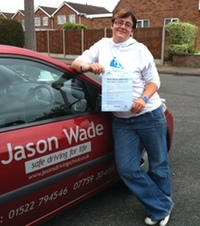 Jason has given me time to learn how to drive at my own pace and he has boosted my confidence in my own driving from his praise and by being supportive. 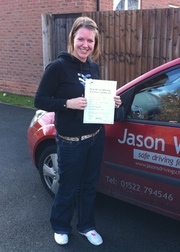 I would recommend Jason to anyone who wants to learn to drive as he is very welcoming, friendly and supportive. Thanks Jason for helping me to pass in the end. 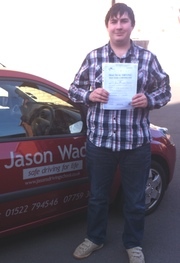 Jason is very influential driver, he says very simple methods yet very informative and easy to remember methods. constantly reminds you to look in your mirrors, but it helped after a while and it became second nature to me. The atmosphere in the car is a welcoming one, and Jason is very easy person to get along with. 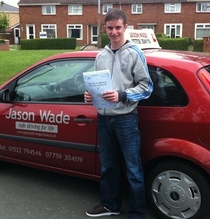 I would recommend Jason as a driving instructor to anyone who asks and will keep doing so. 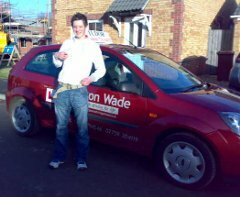 "I always knew that as soon as I turned 17 I wanted to start driving, but when the time came for my first lesson I felt really nervous. 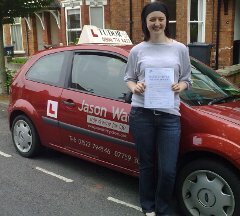 But I had no need to be because Jason’s patient and friendly teaching gave me all the confidence I needed to learn to drive at my own pace. 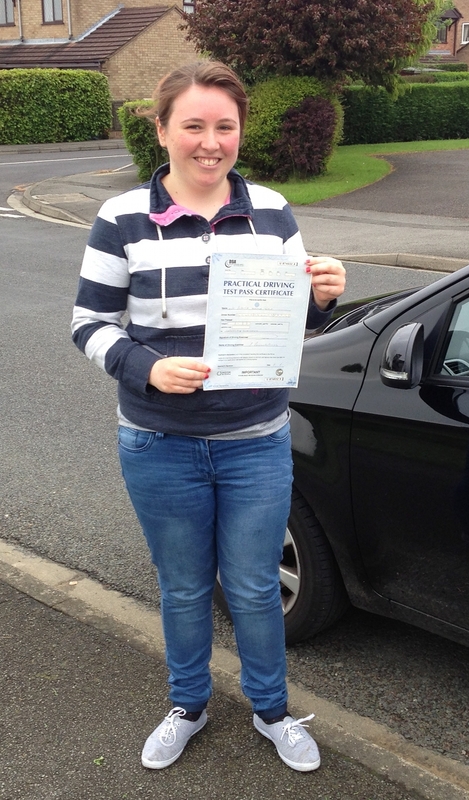 The relaxed atmosphere made it seem more like a friendly chat, rather than a lesson and within 5 months, I’d passed my test first time. I would definitely recommend Jason to anyone who wants to learn to drive. Thanks Jason"
Hey Jason, its Joe Devlin. Thank you so much for showing me the way of the road you was a really good teacher and had awesome teaching techniques. I'm really surprised you didn't jump out the car when I first started. 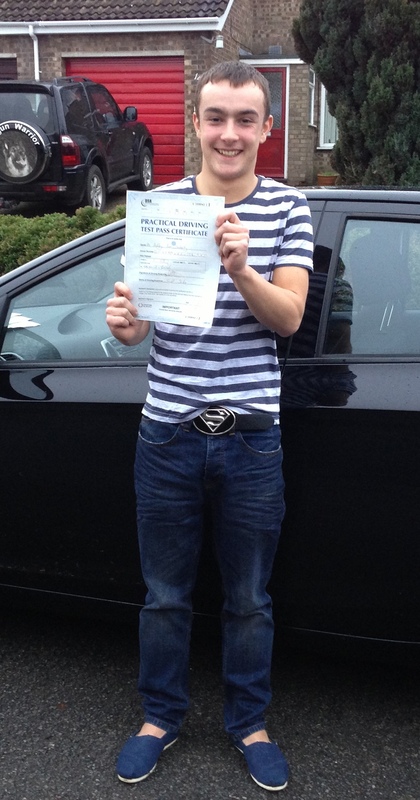 but still you got me passed and first time to! :D Anyway thanks for everything ! 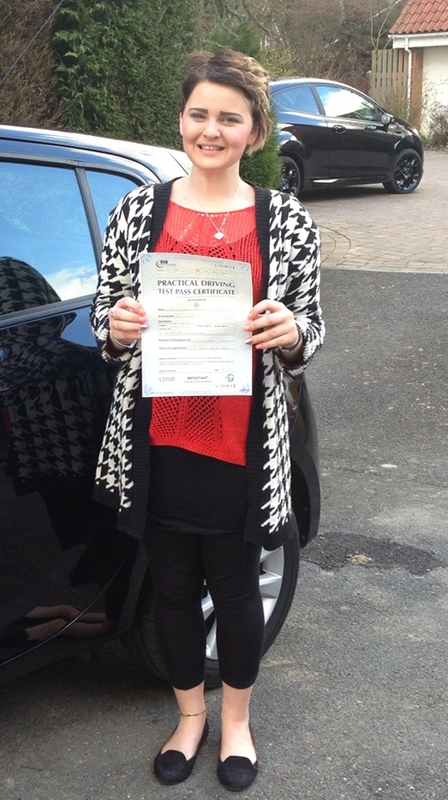 "I still can't believe that I passed first time! 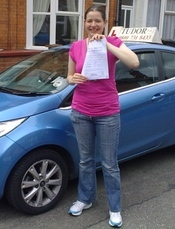 When I started learning to drive I was so scared, I even got freaked out on my first couple of lessons when lorries and buses were coming towards me in the opposite direction! By about my fourth lesson most of my nerves had gone and that was thanks to Jason. One of my worries about learning to drive was having an instructor who would bore me to death, Jason wasn't like that at all. If I was in a chatty mood Jason would freely chat with me about random stuff like uni or what I'd been up to, but without moving away from the driving too much. This really did make the experience of learning to drive so much more enjoyable rather than just something I had to do to get my licence! 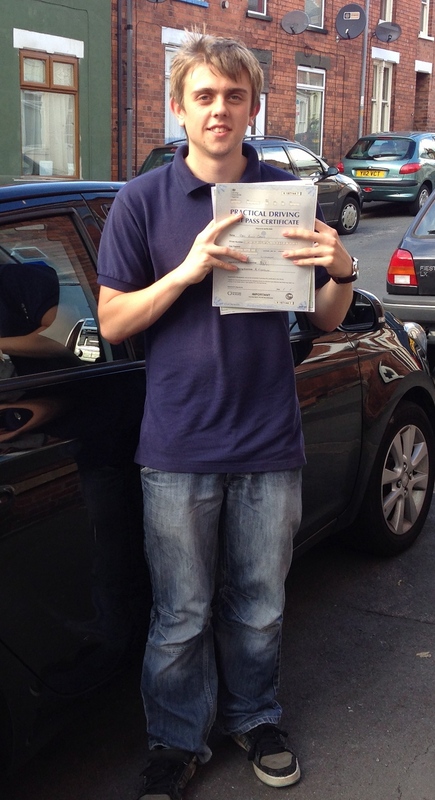 I am very grateful to Jason for helping me to pass my test and for putting up with me for 6 months, I would recommend him to anyone learning to drive whether your full of nerves like I was, or not. If he can teach me to drive he can teach anyone! Thanks Jason! 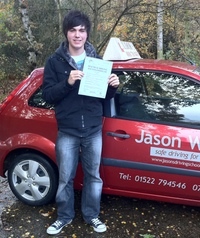 :-) "
Jason is an awesome instructor. He is very patient and supportive. I have really enjoyed learning to drive with Jason over these past two years! He’s such a lovely guy and has a very easy way of teaching so anyone can understand. 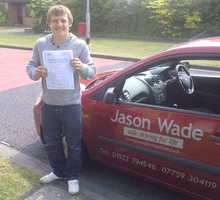 Thankyou Jason for helping me pass. 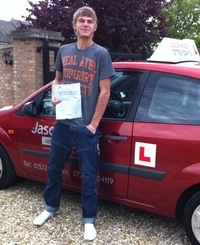 Jason is a very experienced and professional driving instructor as well as being a easy-going and comfortable person to have teach you. I have found his teaching style very informative with as much in-depth knowledge as you would like as well as some very simple explanations. He creates an atmosphere in the car which is as stress free as is possible and he has given me plenty of confidence in my own driving from his praise and helpful tips. 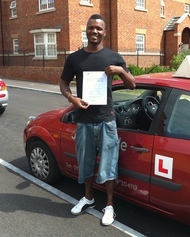 As a driving instructor he is very accomplished and he is also good fun and relaxed, I would certainly recommend him to any learner drivers without hesitation. "Now wheres that £5 you said you would pay me?" 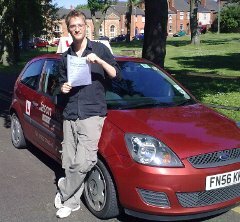 I started learning to drive with Jason in September 2008 and have found him to be a great driving instructor, he has a broad knowledge of the road and excellent teaching techniques! I would recommend Jason to anyone wanting to find a quality driving instructor and I am always trying to get friends to contact him! Thanks for everything Jason! 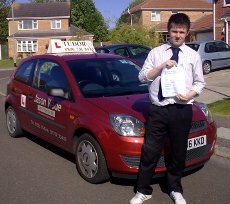 I began learning to drive in June 2008 straight after my 17th birthday. 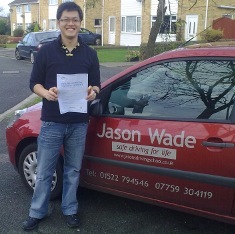 I found Jason's instruction very thorough and yet at the same time very friendly and relaxed. He helped to pass in January of this year. I would definitley recommend him as a good driving instructor. Thanks Jason! 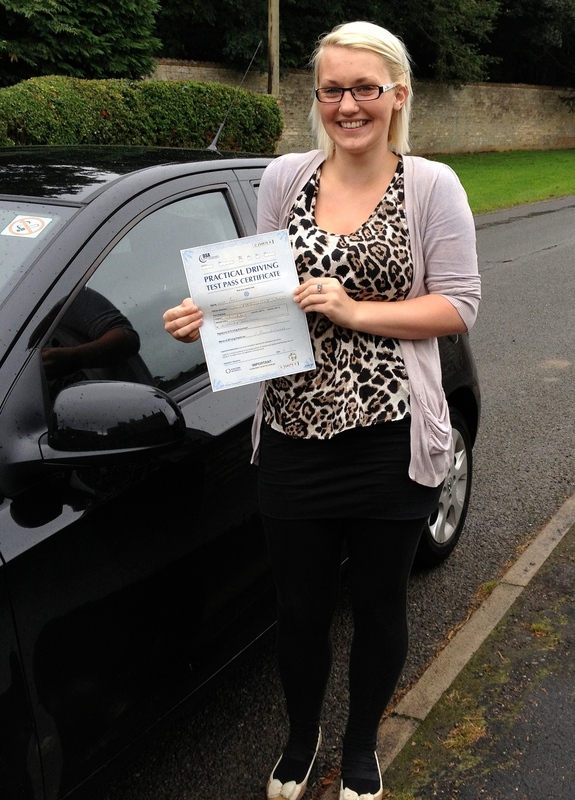 "I began learning to drive in September 2007, at the age of 22. I was a late learner because I could never afford lessons when I was at school and university, and didn't feel the need to learn when I moved to Lincoln as it's such a small city. I then began a new job which would eventually involve driving around the county. 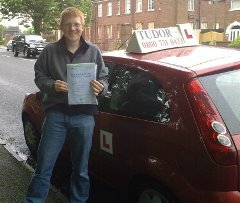 I panicked knowing I had a limited time to learn and decided to contact Tudor Driving School. 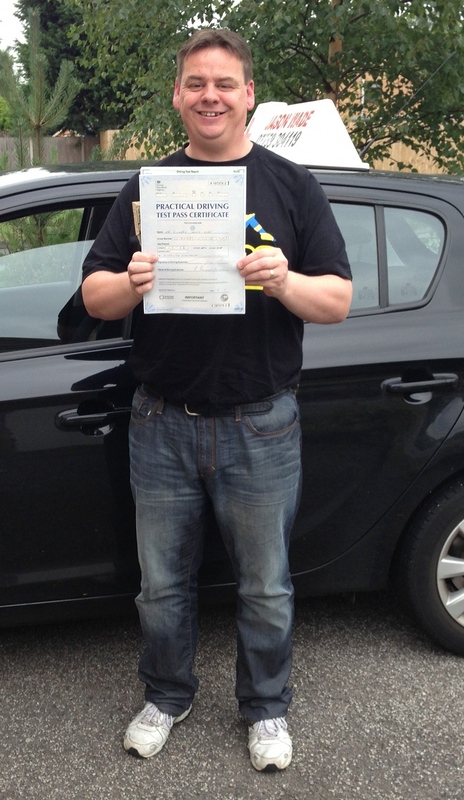 Jason really put me at ease when I began my lessons - I was extremely nervous, having never been in the drivers seat before and I didn't have much knowledge of the highway code. He was always very patient and considerate in situations that I found difficult, and has a thorough way of explaining each manoeuvre. There were times when I felt like I wanted to give up because of my lack of confidence but Jason would take the time to talk to me (he has the patience of a saint!) and build my self confidence and motivation. 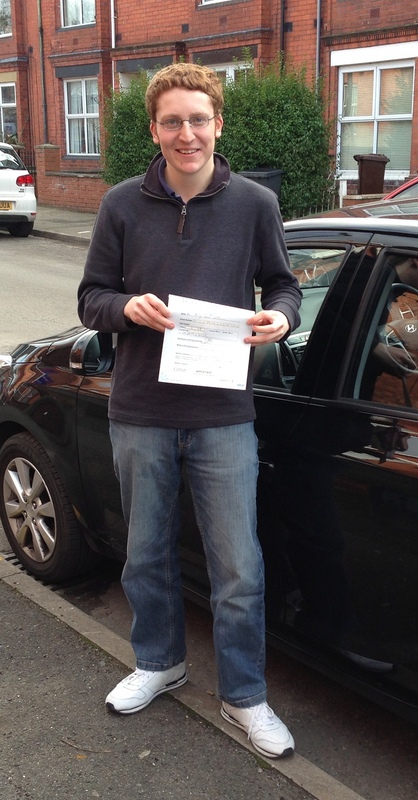 He is very knowledgeable, and it helps that he is very friendly which makes you feel more relaxed when driving. 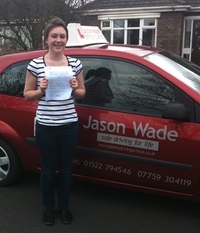 I passed my driving test first time and would highly recommend Jason - he has all the positive attributes that a driving instructor needs", thanks, Becky.